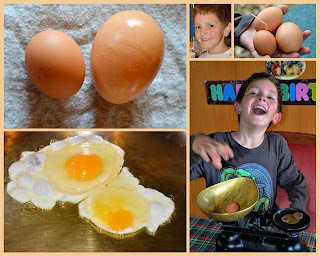 Hamby Home(in)stead ...: Extreme eggs! Our chookies have now been with us a fortnight - and each week they've gifted 20 eggs! Although we have recorded egg numbers daily since the girls arrived, last week Vaughan diligently weighed each egg and recorded those figures also. 60-65 grams is the most common weight, so there was much amusement the day that one egg weighed 75 grams - the largest yet - and just as much (if not more) giggling two days later when Vaughan found the smallest egg ever (just 30 grams)! He has eaten both extreme eggs tonight - fried cos he wanted to compare the yolk/white ratios of each. (He doesn't actually like to eat egg yolks but on this occasion the smaller egg was entirely eaten, so it must have been good)!